King Krule has not officially announced a new album but there is speculation that it should be coming soon. Several fans have received mysterious packages in the mail containing a poster seemingly connected to the artist. The poster features a surreal, black-and-white photograph of the artist sitting across the table from a dog on one side and a block of text in Spanish on the back with “King Krule” printed at the bottom. Two lines roughly translate to his album titles A New Place 2 Drown and 6 Feet Beneath the Moon. See the poster here. He has also been performing new music at recent shows and released this video of a new song last week. If the album is anything like this song, it may just be his best work yet. I first encountered King Krule in high school on a mix CD given to me by a friend. The song on the mix was “Easy Easy” the opening song of King Krule’s debut album 6 Feet Beneath the Moon. I was not as obsessed with music back then but I could tell that I was listening to something unique. King Krule is a project by Archy Marshall. When the first album came out in 2013, Marshall was just a 19 year old kid from London. I remember stumbling upon this video of Krule performing at Pitchfork 2012. King Krule looks like a tall, skinny Ron Weasley. Upon just listening to his music it would be hard to ascertain what an artist with a deep, powerful voice like his would look like. 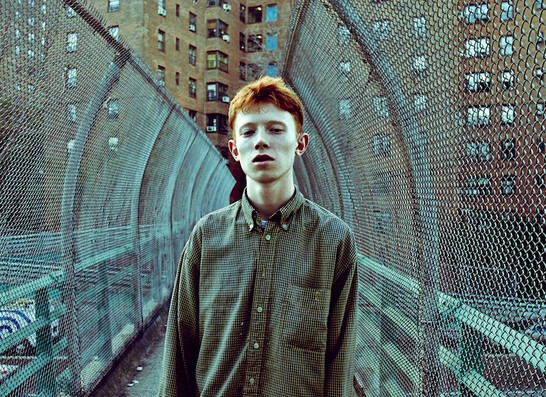 In the above video King Krule was just 18 years old and hadn’t even released his first full length album yet. These lines elicit the feeling of Krule falling in love and seeing a way to beat his loneliness but he recognizes that it could end badly. This is a feeling any young adult can relate to and this is what draws me to King Krule. In 2016, Archy Marshall came back and decided to release an album under his real name. The depressing, lonely tone persists but musical stylings seem more progressive even though its strongest influences may be 90’s hip hop. Marshall made tremendous strides as a producer and songwriter and his album A New Place 2 Drown was praised highly by critics. The album was accompanied by a book and short film. I believe that an artist must consider all aspects in the creation of art and including this short film gives the listener some orienting information with which to encounter the album. I have not seen the book but it is a 208-page art book of sketches, photographs, and poetry from Marshall alongside his older brother Jack. This is similar to last year’s release of Frank Ocean’s Boys Don’t Cry Zine to accompany his release of Blonde. See Archy Marshall’s short film below. In the period of starting a new school year it is easy to feel isolation and confusion. New situations can be difficult to adapt to and loneliness is an all encompassing feeling. You can be surrounded by people and still feel lonely. In the first weeks back at school I have found early King Krule and Archy Marshall on repeat for this reason. Listening to his music on a daytime walk through campus with thousands of kids around you going about there day can be an interesting experience but it is an experience that I thoroughly enjoy.